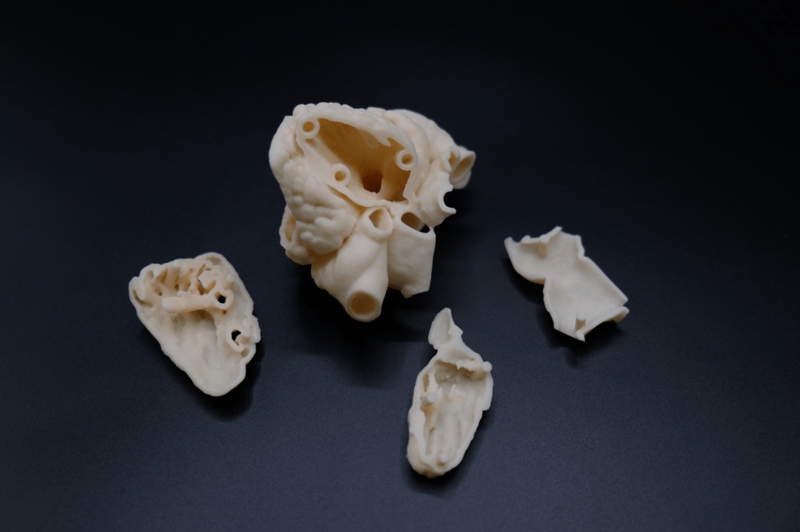 3D printing in medical by Harn Engineering Solutions Public Company Limited helps planning the surgery by creating a 3D model to accurately assess patient’s condition, this shortens the surgery which reduces injuries and recovery time possible. This article present two case studies of creating a 3D model of patients heart that allows physician and surgeon to accurately plan the operation from Harn Engineering Solutions Public Company Limited in collaboration with Dr. Noppon Taksaudom, Cardiovascular and Thoracic Surgery Unit, Department of Surgery Maharaj Nakorn Chiangmai Hospital, Faculty of Medicine, Chiangmai University. After the surgery, the patient cannot stop using the respirator. The patient needs to undergo tracheostomy and taken care in the intensive coronary critical care unit. Medical team tried to increase weight and heal any complications for the past 2 years; however, the patients still had low weight and depended on the respirator. Then, the patient was given Echocardiography and found that the hole in between the left and right ventricles(VSD) is too narrow. These cause blockage between the two ventricles. However, there still unclear element form the diagnosis, especially for the holes between the ventricles(VSD). Sometimes the reading showed a small hole while sometimes showed a big hole with no blockage. After the medical team found that the diagnosis was unclear, the decision was to send the patient to CT-scan. Radiation physician reported that there was a very small 3 mm. hole between the ventricles and both great arteries are in the right ventricle. The team then decide to cooperate with Harn Engineering Solutions Public Company Limited to create a 3D model of this child patient heart. The surgical team selected an area that need to be assessed then section the model to see every internal detail thoroughly to give a clear picture of how the surgery will be proceed. 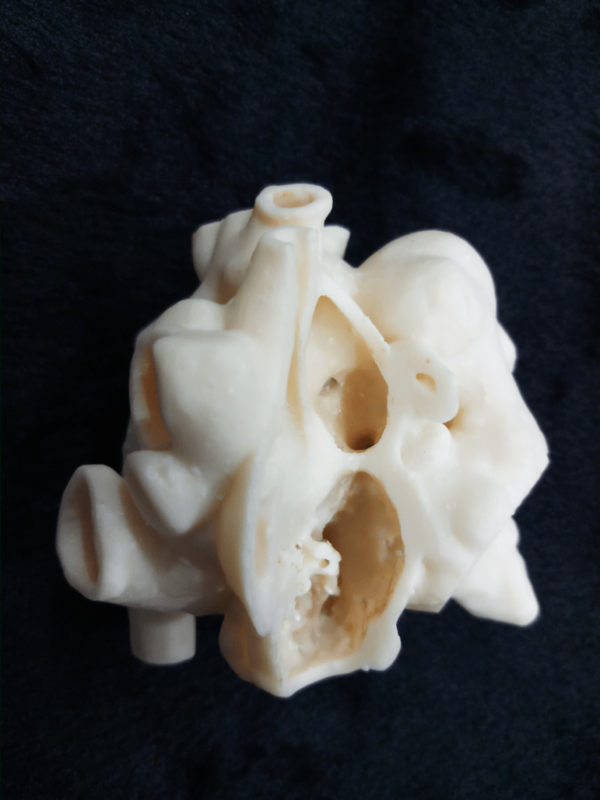 After surgical team received every information needed from 3D file and model of patient’s heart, they went back to review CT scan from the previous examination thoroughly this lead to a conclusion that this patient has Double Outlet of Right Ventricle(DORV). This confirmed that the first diagnosis gave the correct result. However, there were more than one leakages; one under each great arteries. The first leakage was a small hole of 3 mm. under the aorta (Small restrictive subaortic VSD). While the other one is a much larger hole of 2 cm. under the pulmonary valve (Large outlet muscular VSD). Both holes were separated by a wall (Conal septum). With all of the information received and the surgery planned, the surgical team then proceed with the cardiac surgery and corrected all abnormalities as planned. After the surgery, the patient recovered well with no complications and in a short time, the patient could live without the respirator and ready to return home. Help the medical team to diagnosis a rare condition and make planning for surgery much faster. Second case: a newborn male, healthy enough to return home after his birth like normal. However, after 3 months, the baby has shown a symptom of abnormally fast breathing and very fatigued. The Patient’s mom then decided to bring the patient to a hospital and receive a ventilator to prevent heart failure, afterward this patient was sent to Chiangmai Hospital for examination. The results showed heart disease where there was an extra chamber form up in the patient heart (Cor triatriatum sinistrum), this caused to blockage for blood circulation from the lungs to the left atrium and led to flooding in the lungs. 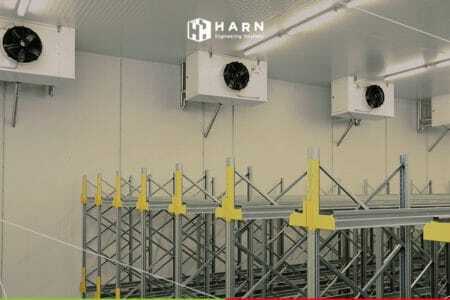 This was not a common case after the medical team ran patient through a CT Scan, then sent the result to Harn Engineering Solutions Public Company Limited to create and print a 3D model for the medical team to study and plan for surgery to reduce unnecessary injuries the infant. After the 3D model of patient’s heart was studied thoroughly, the medical team then proceed with surgery to fix abnormalities of the patient’s heart. The patient’s recovery rate after the operation was very fast and able to stopped using a respirator, then return home within 10 days after the operation. 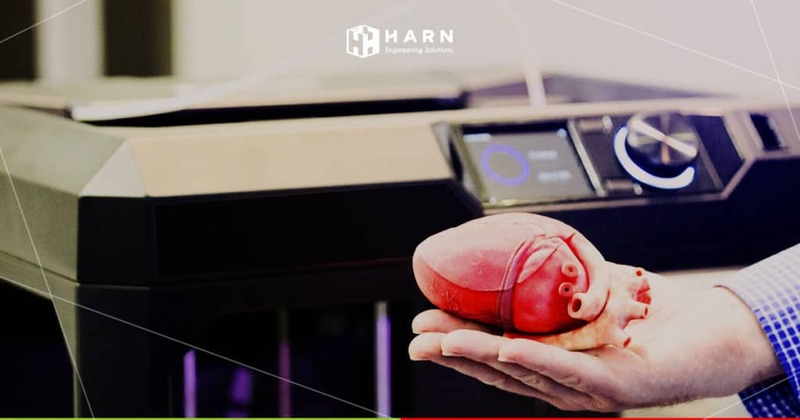 Harn Engineering Solutions Public Company Limited helps create and print 3D models of patient’s organs so that medical team can do further studies and plan before surgery. Since 3D models help the medical team to clearly see composition within the organs. 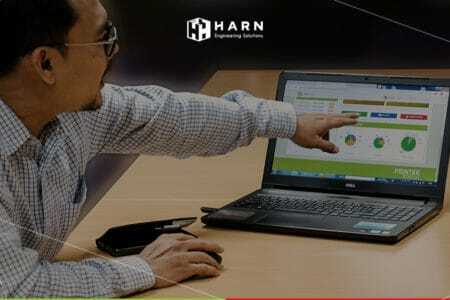 Furthermore, the 3D model is very customized to the patient where the only necessary area of patient’s organs is selected from case to case to improve the operation. In addition, planning also reduces unnecessary post-operative trauma to patients and reduced rehabilitation time. Moreover, the 3D model can be further used as a case study for the medical student in the future. 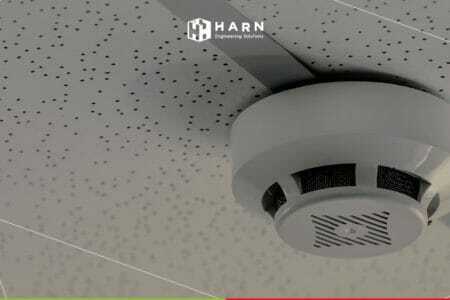 if you are interested in 3D printing or interested in 3D printing for medical purposes, please contact Harn 3DMed. We have specialists about 3D printing that are more than welcome to give you advice.